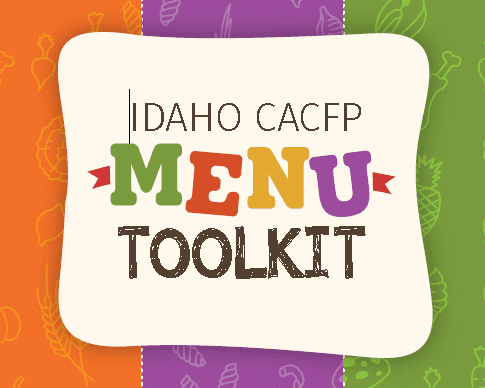 When using a recipe from from the Idaho CACFP Menu Tool Kit use the recipe title and page #. The above link will redirect you to USDA Standardized Recipe webpage. Recipes are available for servings of 25-50 and 50-100. If you are a Family Daycare Home you may scale the smaller recipe and have a usable recipe for the number of children you serve. Many recipes are not available at this time as the recipes are being updated with crediting documentation. SVDP has a number of recipes that can be used in the mean time listed here. The above link will take you to the USDA CACFP Recipes. These recipes have been taken from older sources and show crediting information that has been processed here at SVDP. For Centers these recipes are listed in the MM food picker under UDSA recipes. to be released September 17, 2018. For providers that are keeping paper records a list of recipes will be supplied at the upcoming Workshop for FY19. When serving these recipes you are fulfilling your menu documentation requirements.